Dekalb County police received a 911 call regarding a possible burglary. The only problem was the caller didn’t have the exact address. So, three officers were dispatched to an intersection near where the call was made. Once there, they set out on foot to try and locate any house that matched the description given by the caller. The police then randomly found a ‘one-story, brick and tan’ home. Police claim they tried to ‘establish contact’ with the home’s occupants. When nobody from within the home responded, police took it upon themselves to go to the back of the home, and enter through a rear door they claim was unlocked. Once inside, the officers encountered a dog. 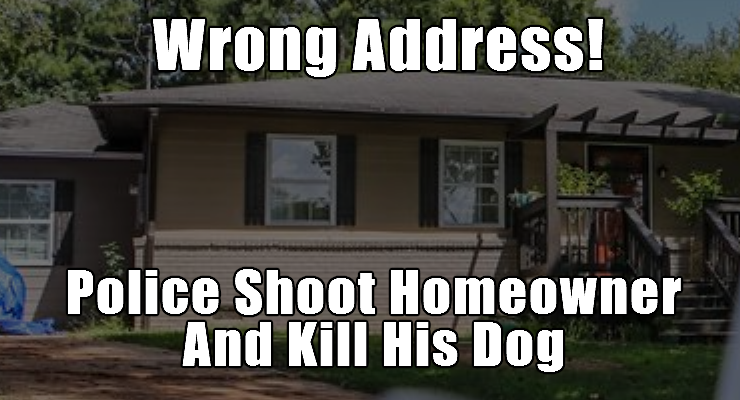 Two of the officers fired their weapons, killing the dog instantly. The homeowner, Christopher McKinley, left the comfort of his own bed to find out what the noise was. Police then shot him once he came within view. McKinley was shot in the leg and transported to a nearby hospital for his gunshot wound. One of the officers, Officer Travis Jones, was shot in the hip and is in serious condition. 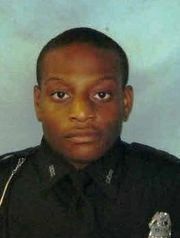 The Georgia Bureau of Investigation, or GBI, stated that the officer was likely shot accidentally by one of the officers on the scene – either by Officer Timothy Harden or Officer They also admitted that the residence was unrelated to the 911 call. The case will be turned over to the DA following the ‘independent investigation’. Atlanta, GA – On Monday, August 31, 2015 at approximately 9:40 p.m., the DeKalb County Police Department (DKPD) requested GBI assistance in reference to an officer involved shooting. DeKalb County 911 received a call on this date at approximately 7:35 p.m. concerning a possible burglary in progress. DKPD officers were dispatched to an address off Bouldercrest Road and Boulderwoods Drive, Atlanta, DeKalb County, Georgia. The officers were provided a description of the residence by DeKalb County 911. The residence was described as a brick and tan one-story home. Three DKPD officers arrived and located a home at 1500 Boulderwoods Drive matching the 911 physical description. Officers approached the residence and attempted to contact occupants at the residence. No contact was made. Officers made their way around to the rear of the home and gained entry to a screened porch and then entered the residence through a reportedly unlocked rear door. The rear doorway entered the residence’s kitchen area. Upon entry to the residence, the officers encountered a dog. Two officers fired their weapons striking and killing the animal in the kitchen. A male in the home, later determined to be the homeowner, exited a room off the kitchen and was also shot by the responding officers. The homeowner was shot in the leg and transported to Atlanta Medical Center, where he was treated and released. One of the responding DKPD officers was also shot. The officer was shot in the hip and transported to Grady Memorial Hospital. The officer underwent surgery and is in serious, but stable condition. Early investigation indicates that the injured officer was likely shot accidentally by one of the other officers on the scene. 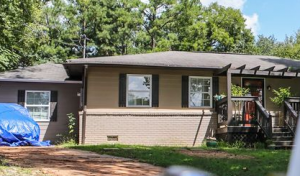 The preliminary GBI investigation indicates that the responding officers likely entered a residence unrelated to the initial 911 call although it matched the given dispatched description. Early investigation by GBI revealed no indication of criminal activity at the residence at 1500 Boulderwoods or on the part of the injured homeowner. The GBI will conduct an independent investigation to determine what occurred during the incident. When the investigation is complete it will be turned over to the district attorney for any action the district attorney deems appropriate.